The Yakutat sport fishing area stretches from Cape Fairweather to Cape Suckling along the gulf coast of Alaska, a distance of approximately 275 miles. The City of Yakutat is the only permanent settlement along this remote stretch of coastline and has a population of approximately 650 people. The Yakutat road system provides access to locations which receive the most sport fishing effort in Yakutat; however, remote areas are becoming popular as roadside effort increases, and options for wilderness transportation increase. 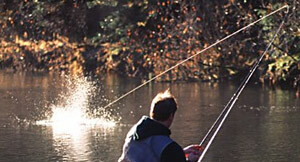 A wide variety of sport fishing opportunities exist in the Yakutat area. All five species of Pacific salmon are available in both fresh and salt water. Resident rainbow trout, steelhead trout, cutthroat trout, and Dolly Varden are present in many stream and lake systems. Northern Pike are available in several small lakes in the headwaters of the Ahrnklin River. Yakutat Bay and the inner islands provide a wide variety of marine fish species such as halibut and salmon.